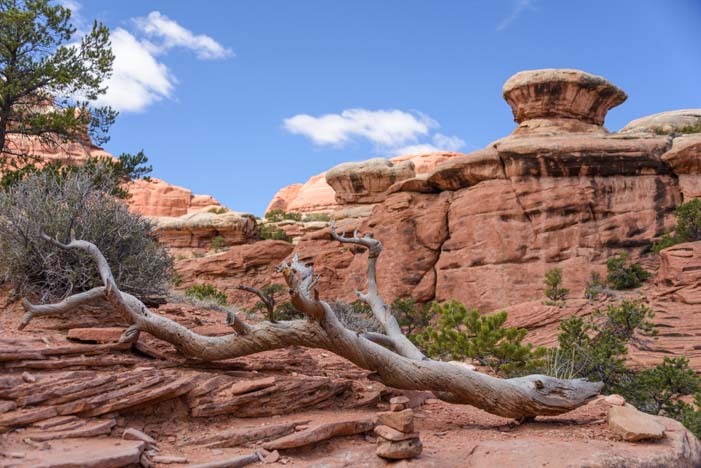 Canyonlands National Park Utah – Hiking in the Needles District! 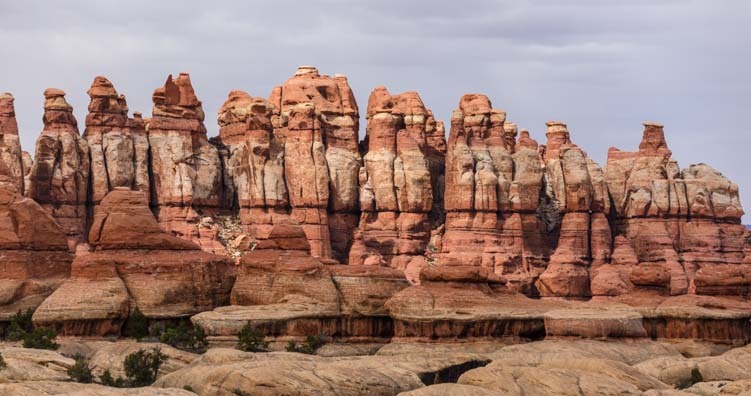 March 2016 – Canyonlands National Park is a stunning and massive National Park full of red rock hoodoos and towering red rock cliffs and wonderful hikes. 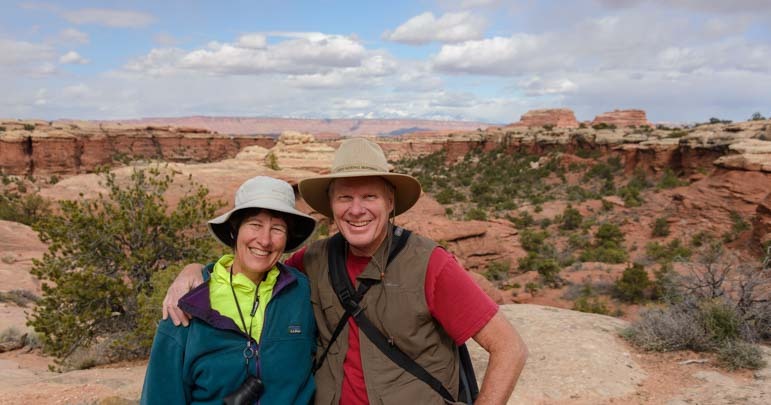 We’d often heard about Canyonlands National Park and were excited to get here at last. 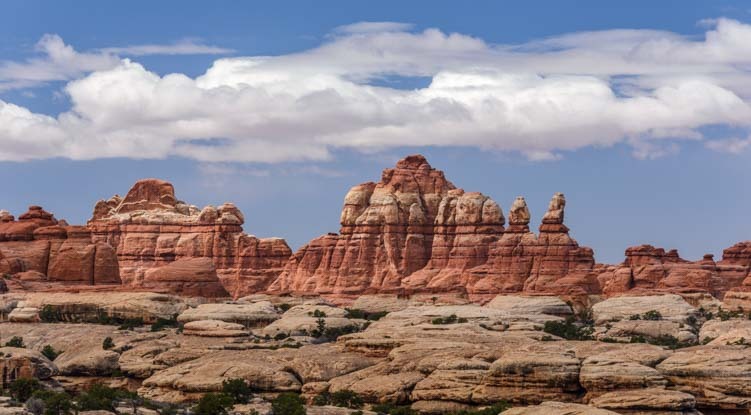 There are three districts within the Park, two of which can be accessed by car on a paved road: the Needles District in the south and the Island in the Sky District a 100 mile drive around the park to the north. After our brief stop at Newspaper Rock outside Monticello, Utah, we continued on the same road about 25 miles further north to the Canyonlands southern entrance at the Needles District. Just standing in the parking lot at the trailhead our cameras began to click! As we stopped at the entrance station to flash our pass and get maps, Mark joked with the attendant who had been making change and issuing passes to a line of cars all day long. All along the trail there were fabulous gnarled limbs and logs that were bleached by the sun. We found out later that this ranger does a Night Sky lecture that is really awesome, but we were there for a daytime hike. 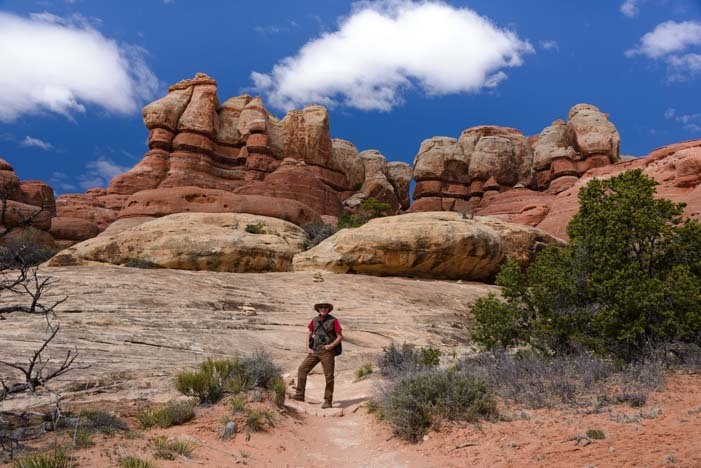 He recommended we do the Chesler Park hike, and before we even got the truck parked at the trailhead, we were already immersed in red rock beauty. 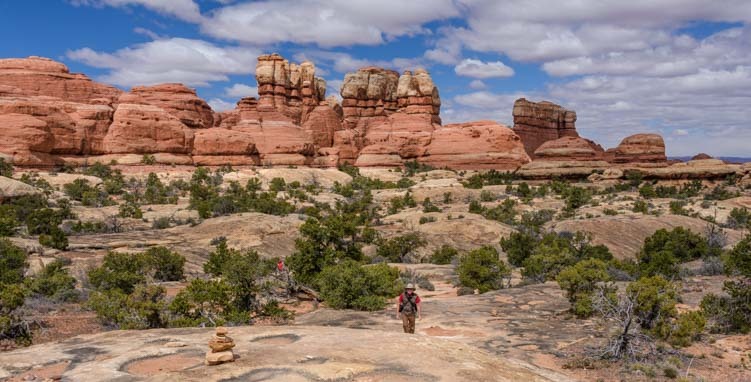 This is a 6 miles out-and-back hike that is loaded with fabulous scenery right off the bat, so whether you go the whole distance or do just a small bit, it is really rewarding. 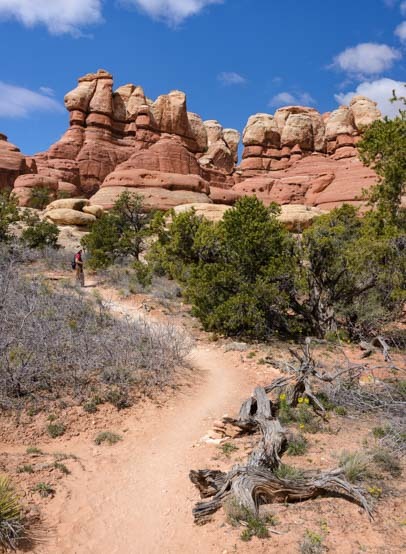 On the Chesler Park hike, the scenery is awe-inspiring as soon as you begin. Right from the get go, after a fairly steep bit of climbing, we were within range of the “needles” red rock formations that give this area its name. Along with the spiky needles, we were surrounded by cool rock formations of all kinds, and it was really tempting to stop hiking and just play in the rocks. 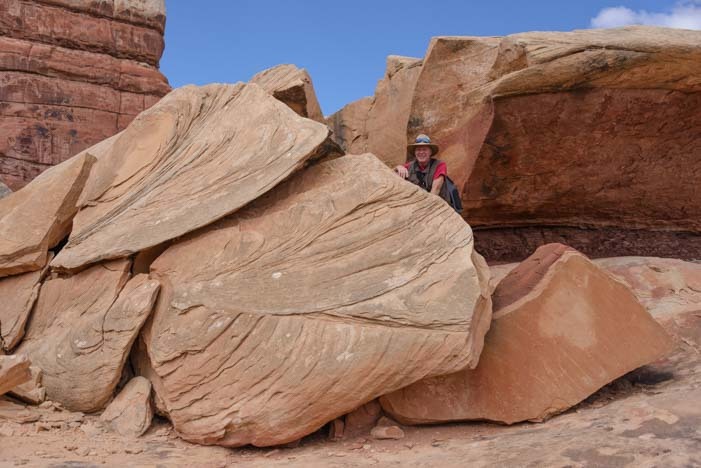 So many cool rock formations lured us off the trail, we found it impossible to stay on the trail! The sandy dirt trail is very clear and easy to find in spots. 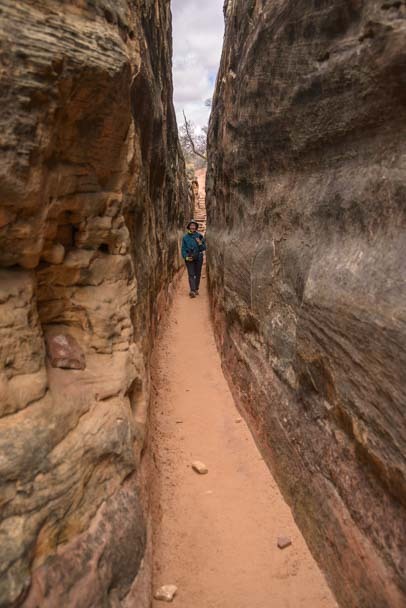 In places the trail was a thin ribbon of sand. But in other places it wanders off across vast flat rocks. Fortunately it is very well marked with little rock pile cairns. The trail wandered off over the boulders, kept in check only by the rock cairns rangers had built for hikers. The fun thing is that there are hundreds of places to sneak off the trail and explore. The views were inspiring in every direction. 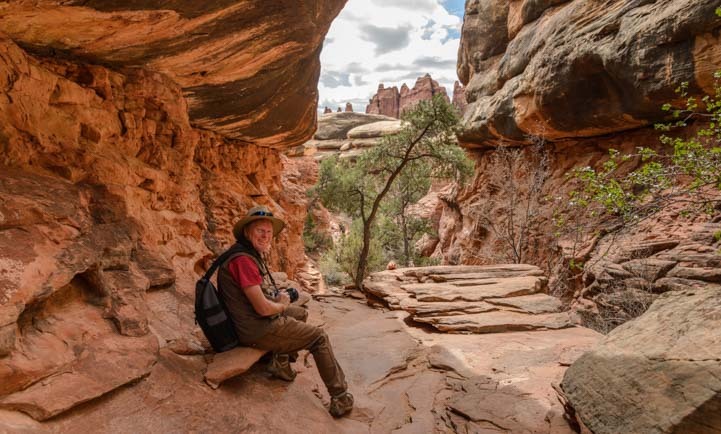 As we followed the trail, continuously tempted by things that were off the trail, it occurred to me that you could do this hike a dozen times and have a totally difference experience each time. Some rock formations resembled spires. The “needles” stand in neat rows, and some rows are more needle-like than others. Suddenly we found ourselves standing among the needles themselves. The needles rose up hundreds of feet in the air. The sky was filled with clouds, and the sun played with the rock formations, alternately shading them and lightening them up. I was caught up by the incredible vistas of rock formations standing all around us, but Mark looked down at his feet and noticed some beautiful wildflowers. 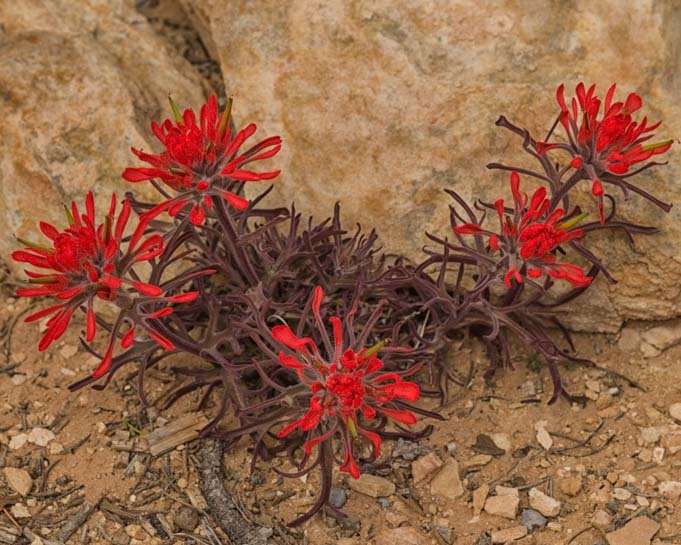 While I gazed at the mammoth rock faces, Mark noticed the little smiling faces of wildflowers at his feet. We had been enjoying all kinds of different scrambles here and there as the trail wandered in and around the rock formations. 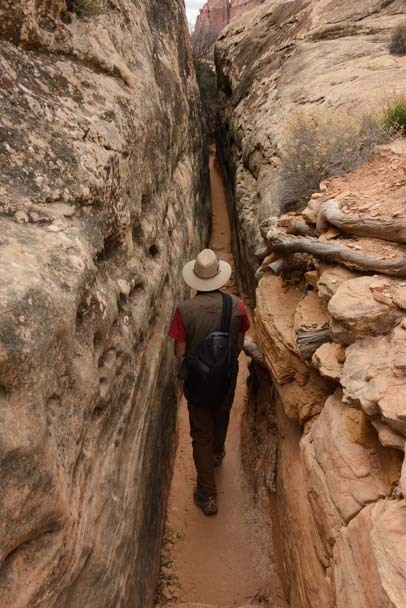 Then, suddenly, the trail descended into a slot. We shimmied through a skinny slot. It was just wide enough to fit a person. We love little slots like this. It wasn’t very long, though, and soon we were out at the other end. We took a break under an overhang. At the other end of the slot a huge rock overhang stretched over us. We were both going crazy taking photos. Back in the rig, Mark played with one of his in black and white. Cool! We turned around to retrace our steps and saw the needles from another vantage point. What a spectacular area. This is a popular hike, and as we walked back we saw dozens of people of all kinds starting out. It’s a great hike for all ages. Lots of families had brought little kids who ran around on the trail, and older couples came with hiking sticks. We even saw a young couple doing the hike as a trail run. Wow! 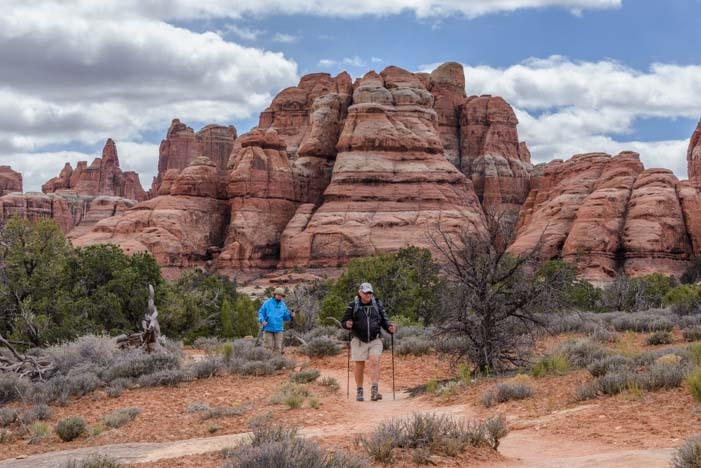 Hikers of all ages love the Needles! When we passed a woman carrying a little while pooch with pink and purple ears, we knew we’d seen it all. 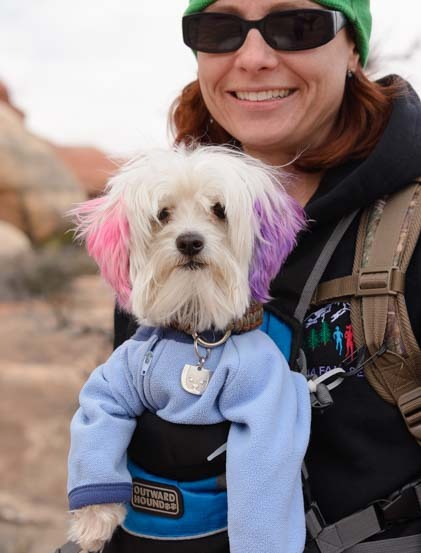 Even stylish pooches enjoy an outing on this red rock trail. 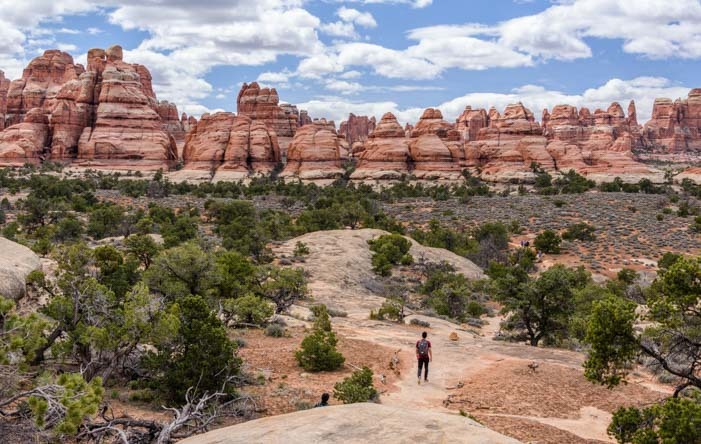 The Needles District of Canyonlands is stunning, and there are hikes galore. Lots of families were camping there for Spring Break (and more than a few mentioned having been caught in the snow in their tents a few nights back like we were). 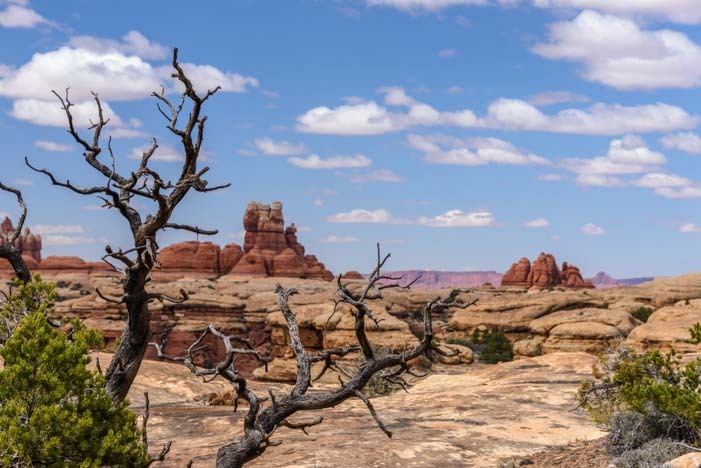 The Needles District is said to be the more beautiful and less touristy side of Canyonlands National Park. 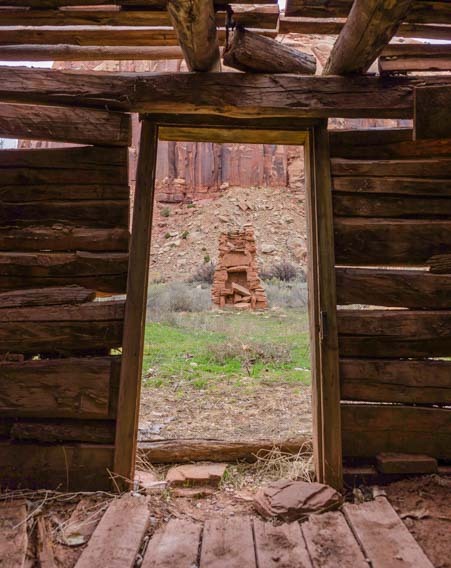 On the way in and out of Canyonlands National Park, there is a tiny homestead on the west side of the road that begs for exploration. We found an abandoned cabin just outside the park. Our “tiny house” on wheels is bigger than this!!! 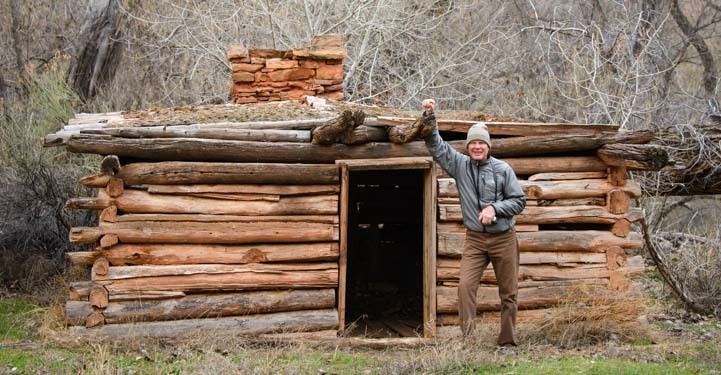 This little cabin couldn’t have been much more than 250 square feet. We couldn’t resist poking around for a bit. I could barely stand up straight inside! “Tiny houses” are very popular these days, and lots of people want to downsize into minimal square feet, whether on a foundation or on wheels. 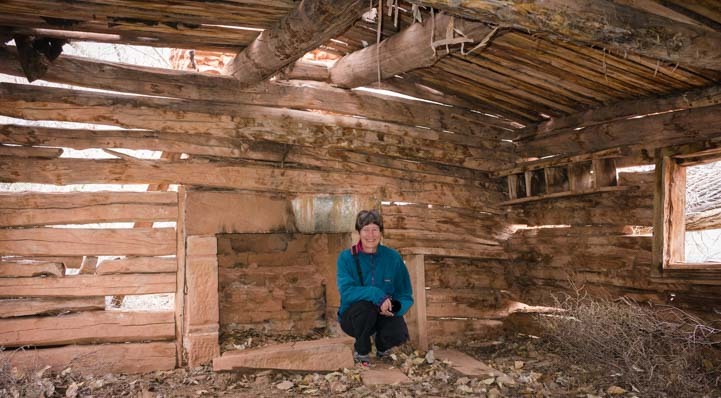 Imagine living in this wee cabin, miles from nowhere, during the winter. To stay cool in summertime, it even had an outdoor fireplace! The summertime fireplace was just beyond the front door. 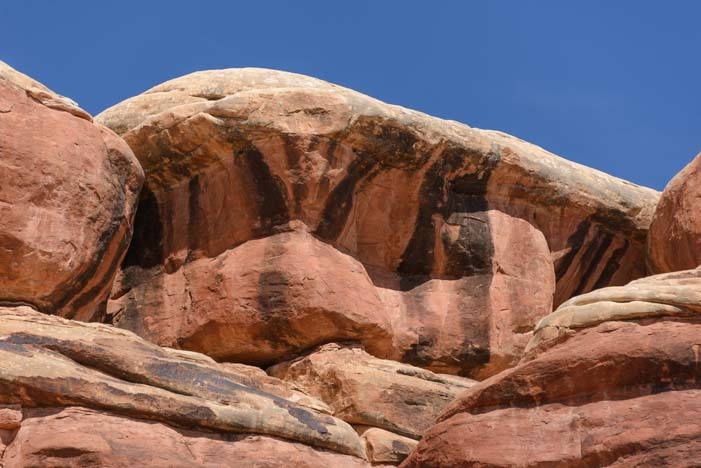 If your RV travels take you through southeastern Utah, it is well worth the detour to visit both Newspaper Rock and Canyonlands, to check out the intriguing sites in between, and especially to do the Chesler Park hike into the Needles red rock formations! 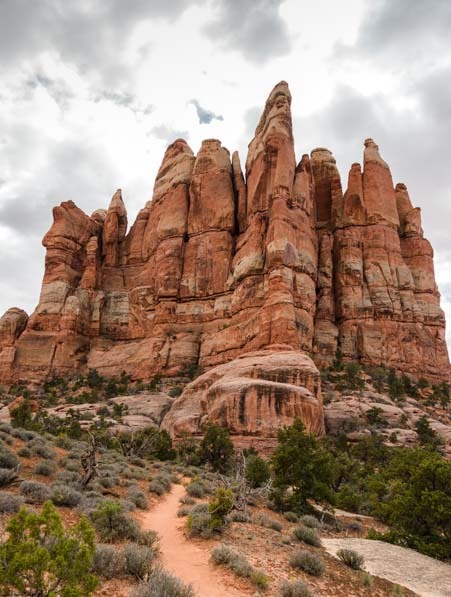 This entry was posted in Utah and tagged National Parks US, New, Travel, USA, Utah, Utah Red Rock Parks, Utah Southeast, Utah Southern, WP Travel by Roads Less Traveled. Bookmark the permalink. Your photography is amazing. Thank you for sharing! Thank you! We have a lot of fun with our cameras. One of our all-time favorite hikes! 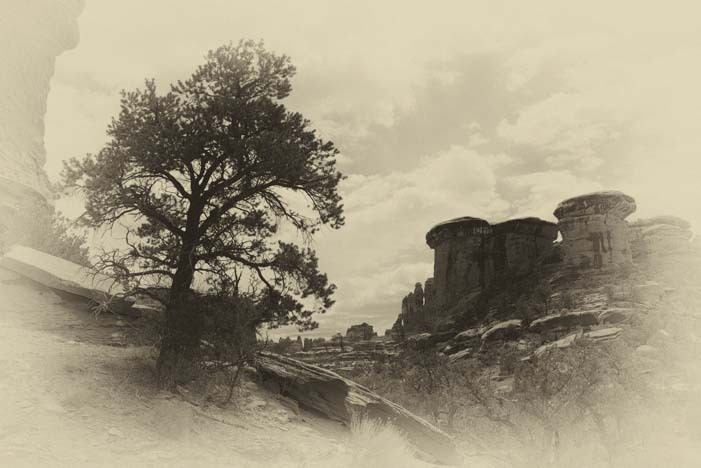 Your photos of it are gorgeous and really capture the grandeur. The dog is cute, but I thought pets were prohibited on the trails in National Parks? Haha, our pets are a stuffed toy raven and chickadee. :-)) We love “real” pets but are waiting until our full-time traveling days are behind us before adding them to our family. We don’t like leaving them in the trailer and it can be challenging to find places to hike with them. 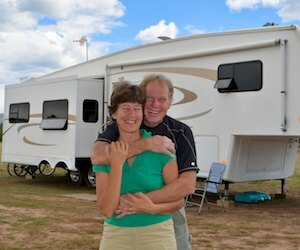 Likewise, and our preferred pets would be a ferret and a cockatoo, probably not the easiest companions in an RV or out on the hiking trails!! You guys just keep making my bucket list bigger! Thanks for all of the beautiful pictures. Very funny! Our own travels make our bucket list get longer too, because we never “see it all” and always have to make plans to go back!!! Happy trails.